Evo & Grace: The WanderLusts: The Macbeth in a new grounds. James Chalmers “Prelude to Macbeth” had its Asian Premiere recently in Manila, under Artist Playground production as their third season opener this 2017. Directed by Roeder Camanag this one act play is the prequel to Shakespeare’s Macbeth, on how he become Thane of Glamis and how he meet Lorna Stewart and become his wife- Lady Macbeth. Fresh from his award winning Direction in Happiness Is A Pearl in Broadway World Award, Paul Jake Paule act the mighty role of Macbeth, the excellent soldier and Chief of Staff of Duncan’s Army. Cath Go and Jernice De Guzman alternately play the role of Lady Macbeth. Other cast includes Mitoy Sta. Ana and Andre Tiangco as Duncan, Gio Cabanlit and Jarden De Guzman as Callum, while the Witches are Merdin Mojica, Tasha Guerrero, Kia Del Rosario, Princess Tuason and Jeremy Cabansag. In this era where theater is on a new grounds, producing a Shakespear’s play is a challenge, even though the materials are already heard and known by many, the attack and its staging should be new, as well as the performances. 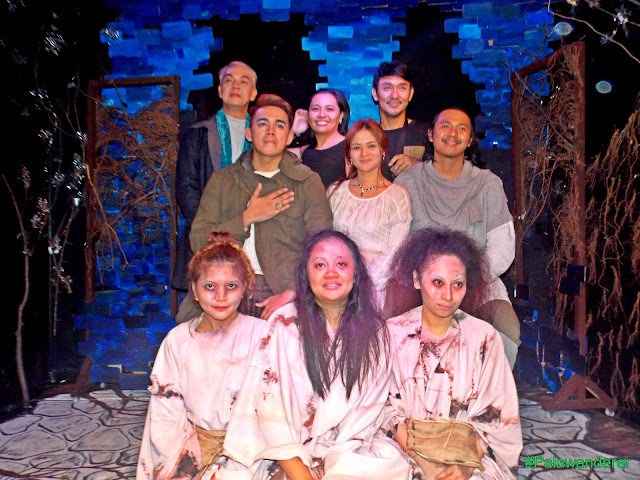 Artist Playground tru Camanag direction gives a different side of Macbeth, that fits in a very intimate show, imagining a few steps near actors on stage, its original music complete the ambiance of feeling in a another era inside the forest. But what best on this is the dialogues, the script that seems old but not that old English, this Chalmers version is easy to digest and to understand. Refreshing indeed since its offer a very close encounter show that no one does so far in Manila theater scene. It was stage at 1701 The Little Room Upstairs in Landsdale Tower in Quezon City. Prelude to Macenth had a limited run, it opens last February 23 to 26 only, but they are restaging it again this coming June. For ticket and inquiries, visit Artist Playground’s Facebook page or contact 09759193179. The artistic team of Macbeth includes Jesse Lucas as the musical director, Reynoso Mercado as the Production Designer, Pauline Martinez-Lighting Designer and Banue Miclat-Janssen as the speech consultant.